“Willis-Solberga” geared head drill presses have been made by the Swedish based company “Solberga” for more than 100 years. “Willis Machinery & Tools CO.” has been selling these superior pedestal drill presses since 1963. Being the sole importer of “Solberga” geared head drill presses in The United States, “Willis Machinery” is able to offer one of the world’s greatest drill presses at an exceptional price, creating a value for the customer that cannot be matched. “Willis-Solberga” drills are also sold with a number of different options. Flange quills are available in order to mount multiple spindle heads. “Solberga” drill presses for sale can either come as manual or power-feed machines. The drills with an electromagnetic (ELM) package provide an electronic push button, for power feed engagement and auto reversing for tapping. Tapping is made possible by the option of automatic reversing or even a foot pedal for convenient operation. Flood coolant is also a popular option for the “Willis-Solberga” drills. Models SE2025, SE2030, and SE2035 all come with a 2-speed, forward/reverse switch, providing 8 spindle speeds. 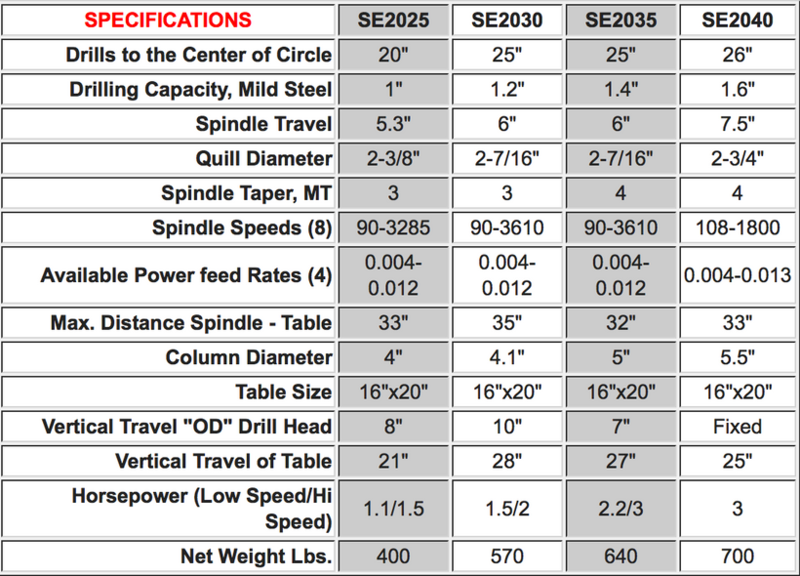 The SE2040 drill press has a single speed motor, and an 8-speed gear box. All of the “Willis-Solberga” drilling machines do have the option of coming with a 220, 440, or 575 volt motor. With the highest of quality parts, and options available at competitive prices, “Willis-Solberga” pedestal drill presses allow customers in maintenance, military, school, fabricating, tool & die, aerospace, and manufacturing operations to fulfill their needs with great ease and efficiency.